This is Not a Film (Palisades Tartan) is one of the bravest films of recent memory. 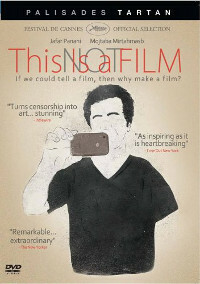 While Iranian filmmaker Jafar Panahi was under house arrest awaiting appeal — he had been prosecuted for “assembly and colluding with the intention to commit crimes against the country’s national security and propaganda against the Islamic Republic” and sentenced to six years in prison and forbidden from making films for 20 years — he used a friend’s video camera and his own camera phone to make this production. This is not a conventional film by any means. It’s something between a diary of his house arrest, a video sketchbook for a film he’s unable to make, and a cinematic essay on his position as an artist denied the right to make art and a citizen suppressed by a government who doesn’t like what he says about his country. It’s also a lively engagement with the creative impulse where, like most every film in Panahi’s career, the border between fiction and non-fiction is indistinct. There’s a tremendous power under the simple-looking surface. Panahi is on camera for the entire film, which was shot by friend and collaborator Mojtaba Mirtahmasb, talking with friends on the phone about his legal situation, addressing the audience to discuss the film he’d like to make but can’t, looking back on his previous films (which he pops into a DVD player) to discuss the nature of filmmaking. But as he sketches out ideas for a film he’s unable to make, the frustration breaks through: telling a film is not making a film. And he clearly is not making a film because, of course, he’s forbidden to. Therefore this is not a film. This is Not a Film is a true act of courage. Panahi made it clandestinely and had smuggled it out of the country in a thumb drive hidden in a cake (call it a cinematic jail break) to show at the Cannes Film Festival, essentially trading any hope of leniency in his appeal to get his statement to the world. It’s not about his suffering, mind you, for he lives well in his apartment. It’s about censorship and intimidation and making your voice heard in spite of it. It is political art in the very best sense, a creative piece of non-filmmaking that defies expectations of documentary, a personal rumination of the necessity of art and the responsibility of an artist in the face of censorship, and a creative act from an artist forbidden to create. It certainly isn’t a commercial film, even by arthouse standards, and it played very few engagements outside the film festival circuit. This DVD release may be the first opportunity for many folks to see this humble yet defiant statement. Ministry of Fear (Criterion), a conspiratorial wartime thriller from 1943, presents Fritz Lang directing a Hitchcockian screenplay, but the sensibility is all Lang. Ray Milland is the wrong man here, recently released from a mental asylum (he was sentenced for the mercy killing of his dying wife) and immediately plunged into the middle of a Nazi spy ring in Britain. Milland emerges from his exile back to the social world with an eagerness to connect. Enticed by the crowds and the energy of a village fair, a charity fundraiser for war widows and orphans, he plays along with the fortune teller and the cake raffle with a good-natured humor, oblivious to the forces of darkness circling around him. He’s assaulted by a blind man who isn’t blind, barely survives a German bombing raid in an otherwise peaceful country meadow, and is framed for a murder at a séance crowded with suspicious characters. Lang constantly lays land mines in seemingly unthreatening locations. This is not Lang’s best film of the era, or even his most interesting portrait of paranoia and malevolent forces, but it is a lively thriller with unexpected turns. Milland’s buoyant attitude is at odds with the increasingly sinister conspiracy that upends his every action, and that’s part of the fun. Where other heroes would spiral into doubt and darkness, Milland’s conviction and optimism is defiant. Meanwhile Lang constantly undercuts expectations when it comes to the oddball rogues gallery of agents and bystanders, all playing roles within roles. Supporting players Dan Duryea and Erskine Sanford are especially interesting, thanks in part to the way Lang refuses to provide us with any easy explanation of who they really are and what motivates them. Glenn Kenny writes the essay in the accompanying booklet: “Forced to deal with menace and fear on a less specific level, Lang returned to his instincts, summoning the great cinematic maker of primal nightmarish myth that he had practically begun his career as and crafting a work that is roundly in the tradition of such magnificently doom-laden paranoid silent thrillers of his as The Spiders (1919), Dr. Mabuse, the Gambler (1922), and Spies (1928). (Not to mention 1921’s Destiny, the film that convinced Hitchcock himself that the art form of the future was being printed on celluloid. )” The entire essay is on the Criterion Collection website here. On Blu-ray and DVD from a new 2K restoration, with a video interview with film scholar Joe MeElhaney and a fold-out insert with an essay by Glenn Kenny. Brewster’s Millions (Hen’s Tooth) was a chestnut of a stage comedy that had been brought to the screen many times before (and once since) when Allan Dwan directed a version for independent producer Edward Small. This 1945 comedy is still considered the best of the versions and it’s a favorite of mine, a modestly staged but sprightly executed comedy starring Dennis O’Keefe as the hapless Brewster. In this version he’s just an American guy fresh out of World War II service and anxious to marry sweetheart Helen Walker, until he’s left a fortune by a rich uncle under the stipulation that he spend the first million in one month with nothing to show for it. And, of course, he can’t tell anyone why. Dwan has a light touch and, let’s face, is there ever a time when the mix of millionaire fantasy and money anxieties is not timely? Eddie Anderson (Rochester on “The Jack Benny Show”), ostensibly the family servant, is hilarious as his sidekick, tossing out sardonic comments with a shrugging resignation. DVD.